To prepare the quail, saute the onions until wilted and translucent, about 10 minutes. Add the garlic and cook one more minute. Allow the mixture to cool. Meanwhile mix the remainder of the ingredients together. Add the onion mixture when cooled, and mix well. Divide into 6 portions and stuff into the cavity of each quail. Season the outside of the quail with salt and pepper. 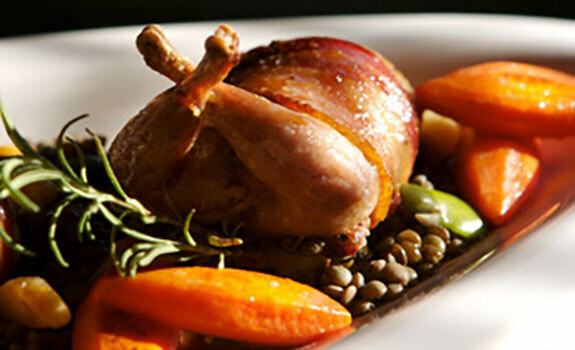 Heat a grill to medium high, and cook the quail until a thermometer placed in the center reads 165 degrees. Pull off the heat and allow to sit 5 minutes before serving. For the jus, heat a sauce pan over medium heat. Pour in a tablespoon of oil, and saute the carrot and onion until caramelized, about 15 minutes. Add the tomato paste and cook for 1 more minute. Pour in the Syrah and beef broth. Cook until mixture reduces by half. Pour in the balsamic vinegar, and cook for 5 minutes longer. Mix the cornstarch and water together to form a smooth paste. Pour into the jus, and cook for 1 minute longer. Remove from heat and strain. Season with salt and pepper. For the potatoes, place the Yukon Golds in a pot and cover with water. Bring to a boil and continue to cook until the potatoes are fork tender. About 40 minutes. Remove from the water and allow to cool slightly. Then place in a bowl and smash with the skin on. Add the roasted garlic and Parmesan cheese. Season with salt and pepper and mix well. Beat the egg and pour into potato mixture. Combine well. Add the flour. The mix will be slightly sticky. This is ok. Divide the mixture into 6 patties. Heat a saute pan over medium heat. Pour in 2 Tbsp of oil. Add the potato patties to the pan and cook until golden brown, about 3 minutes. Flip over and cook until golden again. Place a potato cake in the center of each plate. Put a quail on top of each potato cake. Ladle the jus over the top and serve.